Weddings are one of the most memorable events in a person’s life and here at Sofitel Krabi Phokeethra Golf and Spa Resort, we have the venues and the facilities to make your Krabi wedding a truly memorable one. The 276-room luxury resort overlooks tranquil blue ocean and sandy white beaches.From the 365 sqm Grand Ballroom that can hold up to 350 guests free-standing, to two smaller well-appointed function rooms, we have the inspired settings that will help you create the Krabi beach wedding and honeymoon of your dreams. 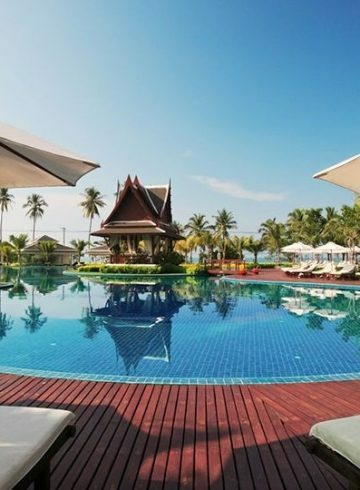 Sofitel Krabi Phokeethra Golf and Spa Resort is located just a minute’s walk from the Andaman Sea, giving your wedding the perfect dreamy ocean setting. Enchanting with its fairy-tale colonial architecture, the resort offers several Krabi wedding packages to suit all needs, budgets and ethnicities from Thai weddings and Indian weddings to Western weddings in Krabi. Sofitel Krabi weddings are planned by the most experienced professionals, who will turn your most romantic visions into reality. The Grand Ballroom is one of the resort’s best venues. Known for being the largest pillar-less Grand Ballroom in Krabi, it is filled with magnificent glittering chandeliers hanging from the high vaulted ceiling. It can hold up to 200 guests in round-table style seating and offers the best audio-visual and presentation technology required for a glamourous affair, suitable for a sumptuous reception for a Thai wedding in Krabi. Its colonial architecture will lend any wedding a fairy-tale touch and combined with the pre-function area, which can accommodate up to 150 people, it is the most splendid way to celebrate a western wedding in Krabi. For outdoor weddings, Sofitel Krabi can arrange for one to be set up among the resort’s tropical gardens or on the beach, for a captivating sunset beach wedding ceremony. 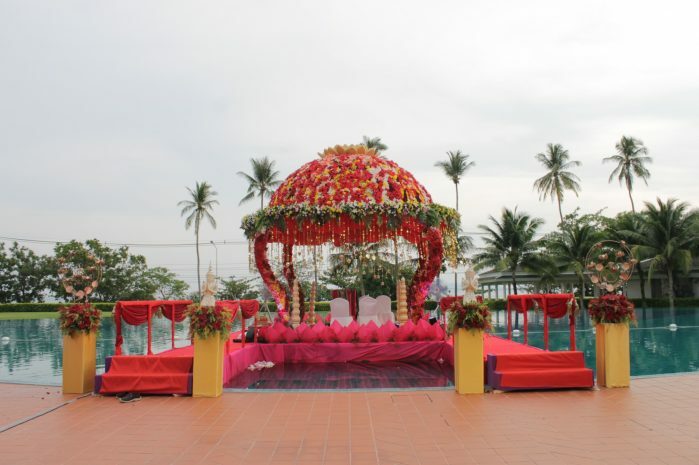 Guests can say their vows against the backdrop of the glittering blue Andaman ocean. Sofitel Krabi Phokeethra Golf and Spa Resort can provide complete wedding coordination, sunset beach wedding decorations and floral arch, classical musicians and bouquets for the bride and bridesmaids to make the occasion an unforgettable wedding service in Krabi. The newlyweds can also enjoy a candlelight dinner, or spa treatment, depending on your wishes. For those who wish to have a traditional Thai wedding in Krabi, Sofitel Krabi Phokeethra Golf and Spa Resort offers a beach wedding package which follows time-honoured customs with blessings from Buddhist monks, as well as sacred water blessings. Sofitel Krabi can provide a specialised floral decoration for the delightful Krabi-based wedding service, along with a traditional long drum parade (Hae Khaan Maak), traditional wedding ceremony with ring exchange (with or without monks), floral wedding neck garlands for the couple classical Thai music for the ceremony and the traditional water blessing (Rod Nam). Refreshments can be catered from Sofitel Krabi’s Maya restaurant, known for its authentic Thai cuisine. As always, your elegant Thai wedding in Krabi can be completely tailored to your needs. wanted to have your dream wedding on a private island Sofitel Krabi Phokeethra Golf and Spa Resort can make this happen! For an extremely attractive price, the resort will transport you and your guests on luxury boats to any Andaman island of your choice. Make your fantasies come true and have the ultimate Krabi beach wedding. Say your vows and have your dream Krabi wedding service among the swaying palms on an untouched piece of paradise, bound to be a simply magical experience for all who attend. You can also opt for your choice of Krabi wedding island decoration, music for the ceremony, bouquets for bride and bridesmaids, corsages for the groom and groomsmen, wedding refreshments for guests with fresh fruit juices and soft drinks, and even a private luxury boat transfer for the couple from Sofitel Krabi Phokeethra Golf and Spa Resort to the island. Packages can be personalised according to your requirements. Living up to its reputation as one of Krabi’s top wedding venues and wedding hotels, Sofitel Krabi Phokeethra Golf and Spa Resort also offers a long list of optional arrangements to make your Krabi wedding the best it can be. 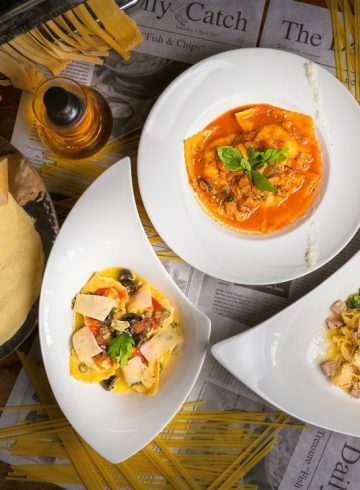 Couples can choose from food and beverage menus that include lunch, dinner, theme party and reception catering with a mix of Thai, Western and Indian set and buffet meals. There are also free-flow beverage packages to choose from and a plethora of entertainments from fire shows and DJs to a quartet band. Couples can also have their pick of other miscellaneous items to make their Krabi wedding come to life, such as hiring a photographer or videographer to document their special moments for years to come. Sofitel Krabi Phokeethra Golf and Spa Resort also caters for Indian weddings. One of the advantages of having Indian weddings in Krabi at this venue is the in-house catering done by Sofitel Krabi’s acclaimed Indian restaurant, White Lotus. 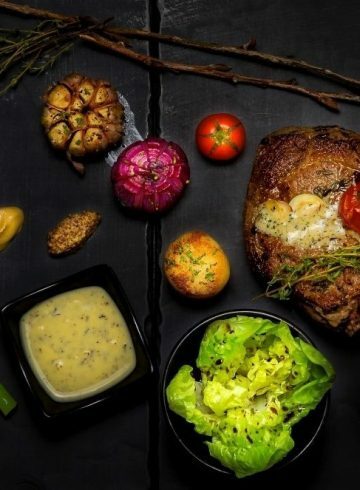 Indian chef Rahul Negi will see to your culinary needs, as you celebrate one of the most important events of your life. Sofitel Krabi’s Grand Ballroom and pre-function area makes wonderful wedding venues in Krabi with a combined capacity of 500 wedding guests for the ultimate Indian weddings in Krabi. Our Dedicated Inspired Wedding Planner Team will create an unforgettable experience for you, your family and your friends. No matter if you plan on having a Krabi beach wedding, or throwing a glittering indoor wedding service, Sofitel Krabi Phokeethra Golf and Spa Resort is one of the best wedding hotels in Krabi. Please do not hesitate to contact us for more information.